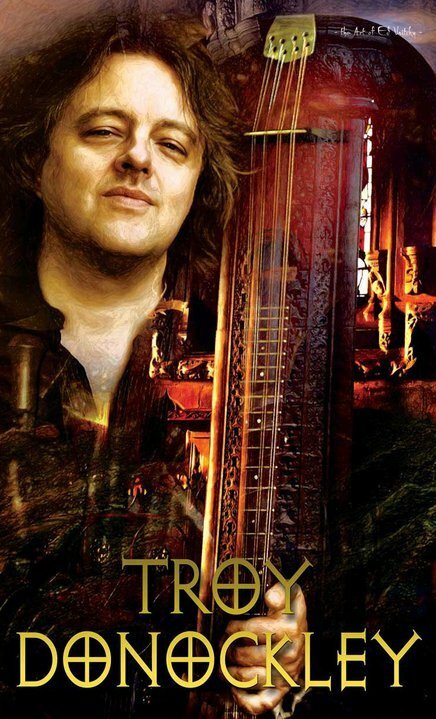 3/19/2012 – London, UK – Troy Donockley has built up a formidable reputation as both a composer/arranger and as a multi-instrumental musician/performer. He is a leading virtuoso of the Uilleann Pipes (and the Low Whistle) and has performed and is known all over the world. His music, which has been described as “A peculiar brand of epic classical-folk-progressive fusion”, can be heard in TV, media and movies (such as ‘Robin Hood’ and ‘Ironclad’) and through various commissions. Troy co-founded the BBC Award Nominated band The Bad Shepherds and as a producer/musician has recorded and toured with various artists such as Nightwish, Maddy Prior, Barbara Dickson, Maire Brennan (Clannad), Midge Ure, Iona, Roy Harper, Lesley Garrett, Status Quo, Del Amitri, Alan Stivell, Mostly Autumn and many, many more. Troy’s first album ‘The Unseen Stream’ released in 1998 was critically acclaimed globally for its unique fusion of traditional/classical forms. His second album ‘The Pursuit of Illusion’ (2003) continued to push the boundaries with a highly individual blend of the English classical and Irish folk traditions. And then, onto the latest album ‘The Madness of Crowds’…featuring a large cast of brilliant musicians it goes even further than before in the quest to make the most emotional and uncommercially driven music possible. If any modern music can shake off the ravages of fashion and hark back to a time when music was created and listened to as Art rather than as commodity and accessory, then by definition this does precisely that…the essence of that ‘lost world’. “I have a massive range of influences,” says Troy. “From Pink Floyd to Mahler, Johnny Cash to Vangelis, Planxty to YES, and Vaughn Williams to Neil Young”.